Did you know the world’s first theme park is located less than 3 hours from Nashville? 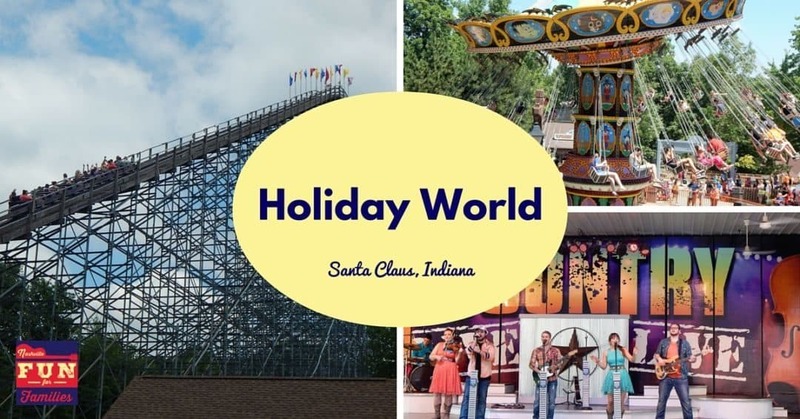 Directly north, in Santa Claus, Indiana, Holiday World and Splashin’ Safari is a great place for a weekend away. The theme park first opened its doors on August 3, 1946, 9 years before Disneyland, and was originally called Santa Claus Land. 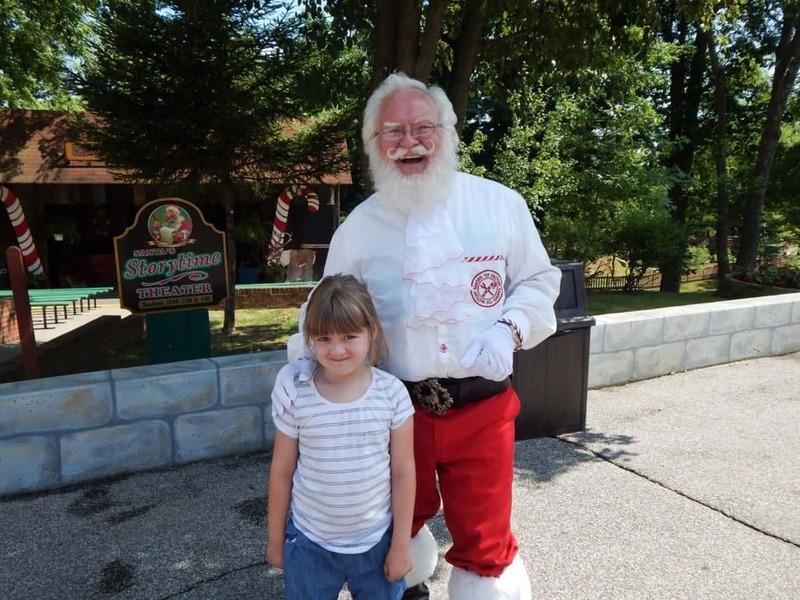 Created by Louis J. Koch (and still family owned), the park started as a retirement project for children that came to visit Santa Claus, Indiana and left disappointed because Santa was not there. The park expanded through the years and in 1984, Halloween and 4th of July were added with more rides and fun. 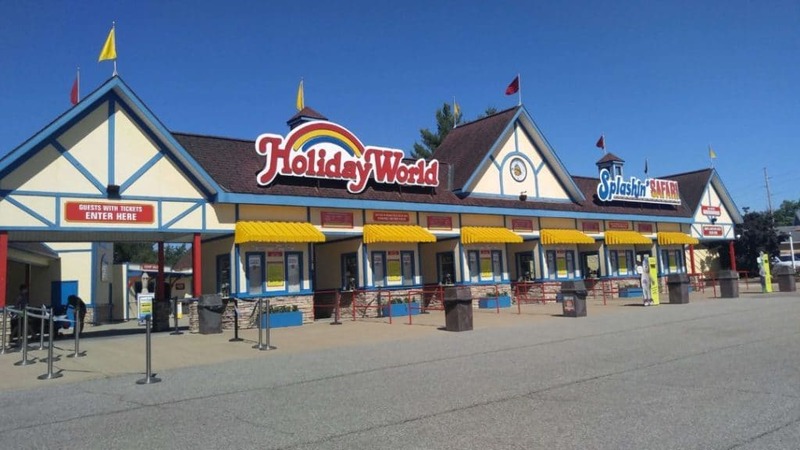 The park changed its name to “Holiday World” at the same time. In 1993, Splashin’ Safari, a water park, was added and then in 2006 the Thanksgiving section was added. Now, in it’s 70th Season, and covering 125 acres, Holiday World and Splashin’ Safari has been named the “World’s Friendliest and Cleanest” and well as Consumers Digest’s “Top Value Park”. Lucky, for us, it’s easy to visit in a day. We visited Holiday World on a week day in mid-June. I expected crazy lines and crowds, but the longest line we stood in was 20 minutes. The park is spread out and there is definitely something for everyone from toddlers up to Grandparents. Our family made a long weekend out of the trip and we stayed right next door at a cabin at Lake Rudolph’s Campground and R.V. Resort. There is free parking at Holiday World, but we used the free shuttle that runs from Lake Rudolph to Holiday World’s front gate. You enter Holiday World through Christmas. If you have small children, this is a great place to start your visit. There are 5 rides that are all for kids under 54″ tall (merry go rounds, rockets that fly in a circle, etc) plus Reindeer Games which is a mild thrill ride for kids over 42″. You can also see Santa and spend some time listening to stories at Santa’s Storytime Theater, which is a great place to sit in the shade. Kringle’s Kafe offers pizza and burgers in air conditioning and you can get ice cream, cookies, other treats and coffee in Mrs. Klaus’ Kitchen which is attached. If you like roller coasters, then Halloween is the place to be! You can ride two different wooden coasters, The Raven and The Legend. Both require riders to be 48″ tall. It had been quite a while since I’d been on a wooden coaster and it’s definitely different than a steel track coaster. Both rides were bumpy with tight twists and turns. I thought The Legend was the smoother of the two rides. Halloween is also home to Frightful Falls, a log flume ride. We rode it several times and did get wet, but not soaked. There are also swings, the Scarecrow scrambler which spins in tight circles, and some carnival games to enjoy. Do you look forward to your County Fair every year? If so, this area is for you! Filled with traditional carnival rides for all ages, there is something for everyone. Older kids will enjoy Revolution (my son rode it 5 times in row), the Liberty Launch and bumper cars. You can take a spin on a carousel and ride while your kids drive cars on a track. Take a turn on the Raging Rapids, but be prepared to be soaked. Nestled in the back of 4th of July is Holidog’s Funtown, which is geared toward little ones. There is a big playscape with jumping fountains (be prepared to have wet kids) surrounded by rides suited for younger kids. There are self-driving cars, spinning tea cups, a train, and a roller coaster which even my 11-year-old enjoyed. Are you a fan of Dole Whip? You know, that magical pineapple soft serve that is served at Disney parks? You can now get it at Holiday World! Find the “Sweet Stuff” snack stand and you can get both strawberry and pineapple Dole Whip. (If you haven’t had it, come to Holiday World, and give it a try and you’ll understand the cult following). This area is home to the two largest roller coasters at Holiday World. Even if you aren’t a coaster fan, make sure you venture back to this area. The Voyage is one of the largest, highest and fastest wooden roller coasters in the world. The initial hill is 163 feet tall. There are three 90 degree banked turns and five underground tunnels and you travel a total of 1.2 miles during the ride. This was the one coaster in the park we were not brave enough to ride. If you ride it, share your experience in the comments. Next to the Voyage, is the Turkey Whirl. 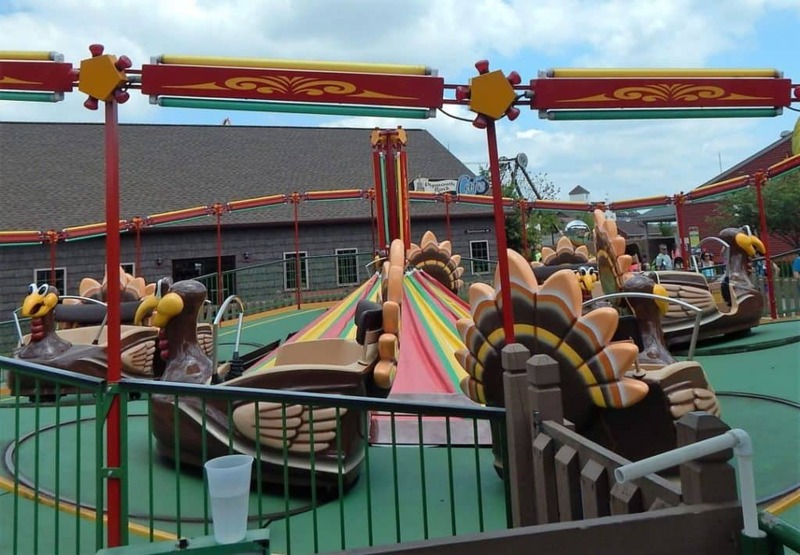 Climb aboard a spinning turkey and feel G-forces at work. Thunderbird is the nation’s first launched wing coaster. Instead of a hill to use gravity to build speed, the Thunderbird is launched and you go from zero to 60 miles an hour in 3.5 seconds. It literally took my breath away. Once I recovered (about 1/2 way through the first loop), I had a great time! It’s very smooth, especially after riding several wooden coasters. The seat and harness wrap around you leaving you feeling very secure. It’s not as scary as it looks, so if you like coasters it is definitely worth riding. Thanksgiving is home to the other restaurant in the park that has indoor seating with air conditioning. As I’m sure you guessed, the meals are what you would traditionally have for Thanksgiving – turkey, dressing, ham, and all the fixin’s. Across from Plymouth Rock Cafe is a metal building that houses the “Gobbler Getaway“. This was fun for the whole family. Climb aboard a car and grab your laser gun (each rider has one) and shoot the runaway turkeys. This is similar to the Buzz Lightyear ride at Disney World and the M.I.B. ride at Universal, but the lines were 5 minutes or less when we were there as opposed to an hour wait for Buzz. It was one of my family’s favorite rides. In addition to all the rides, Holiday World has some great shows! You can catch Holidog and his pals in Holidog’s Funtown and sing some preschool favorites. Join Santa for storytime in Christmas, and see some amazing high dives in Halloween. The main performance stage is inside 4th of July. The seats are shaded (a nice break from the summer heat) and there are several different shows throughout the day. See some Magic, sing along to Country Music hits, or enjoy some gospel. Our favorite show was WOW: World of Wonder, a 20-minute mix of music, dancing, and acrobatics. My daughter loved it and we had to see it twice! Once you get in the park be sure to stop and take a picture with Santa. We saw families that visit the park every year and take a new annual picture to watch their kids grow up. Take your child to the “height station” before you get started. Park employees will measure your child and give them a wristband so you don’t have to stop at every ride to check to make sure your child meets the height requirements. A lost child at an amusement park is every parent’s nightmare. 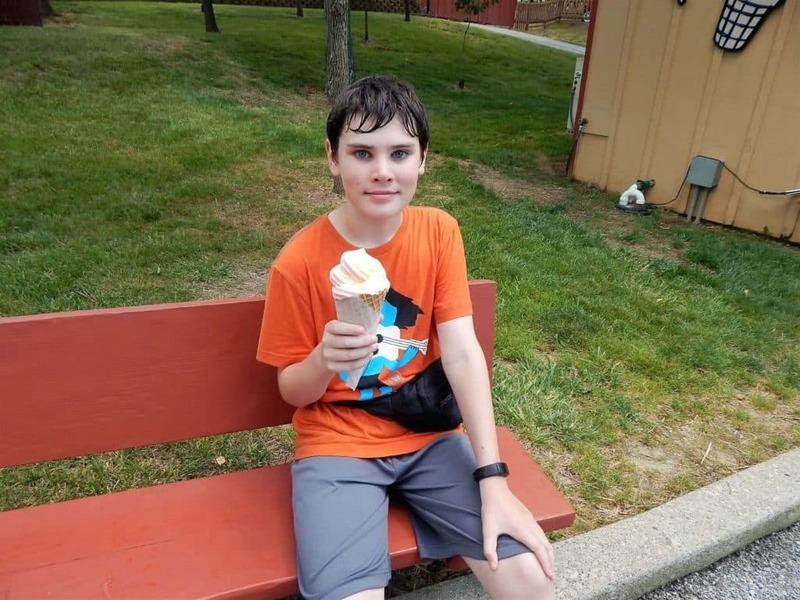 Holiday World provides free “Phone Find” wristbands (get one at Lost Parents, Wagon Rental, or In-Park Services, all located at the front of the park) that your child can wear in case you get separated. Tell your child to ask a uniformed employee for help and they will call your cell phone so you can be reunited. The park also suggests that older children and adults pick a meeting place in the park just in case. We discovered that cell phone service can be spotty. Be sure to use the park’s free Wi-Fi. There are areas of the park that do have shade, but other areas are in full sun. Stay hydrated with free drinks. There are large huts with giant “Pepsi” signs all over the park. In addition to soda, you can also get water, Gatorade, and lemonade all for FREE. There are FREE sunscreen stations located throughout the park with gallon bottles of SPF 30. Most are near restrooms. If you are only visiting for one day, bring your swimming gear (suits, towels, goggles, etc) and rent a locker. They are located at the front of the park near Kringle’s Kafe or right inside the entrance to Splashin’ Safari. You can open and close the locker as many times as you want during the day with a wristband, so you don’t need to worry about a key. Our family of 4 used a small locker and had plenty of space for our towels or our backpack while we were swimming. Find more details of how they work HERE. Is your family Gluten free? Visit George’s Gluten-Free Pizza in the 4th of July section of the park to get Gluten-Free pizza, funnel cakes, nachos and more! As I mentioned, Splashin’ Safari is attached to Holiday World so there is no need to have to hop between two parks. Plus, you get to visit both parks for the same price. I spoke to several families in line and they had visited many water parks throughout the area and the country and Splashin’ Safari was by far their favorite because there was something fun for everyone. Two wave pools – “The Wave” has gentle waves while the Bahari Wave Pool is more intense. Visit Safari Sam’s SplashLand with your kids for some mild slide fun. Monsoon Lagoon and Kima Bay are both giant water playscapes with slides, a giant bucket that dumps water on you, water cannons and more. There are 10+ waterslides with varying degrees of drops, twists, and turns. Our favorite was Wantubee, which our family rode together in a raft with floor. There are also two water coasters, which really are different from slides. The Mammoth has circular boats, while the Wildebeest has rafts that position one rider behind another. Both were really fun, but the Wildebeest was our clear favorite! All the rides include free tubes and there are life jackets available to use also for free at both wave pools. We rented a locker for our clothes, backpack and phones and then left our towels on beach chairs under a shade cover by The Wave pool. We returned to them several hours later and they had not been disturbed. The concrete can be hot between rides. There were several areas with a built in sprinkler system that kept the concrete cool, but it’s worth having [eafl id=”52044″ name=”Zappos water shoes” text=”flip flops or water shoes”] to prevent burning the soles of your feet on hot days. Our family left our shoes on the side of each pool and most rides had cubbies at the entrance for shoes. Cabanas are available to rent, but unless you have someone in your party that is planning to sit and not swim most of the day, most families don’t need to go to the extra expense. However, if you have a baby or Grandparent with you, a Cabana would be a good place for an afternoon nap or rest. Make sure to visit other great attractions like the Santa Claus Museum and Santa’s Candy Castle while you are in the area. This article has an affiliate link. If you purchase an item then we get a small commission to help us bring you more ideas and fun. We visited in June also and stayed at Lake Rudolph. Thankyou for the trip down memory lane. We cannot wait to go back…it was our first time and are planning on making it an annual trip. We did ride the Legend…my 8 year old loved it…and with practically no lines bc there is so much to do I had no time to chicken out…lol. glad I didnt though…it was amazing…loved the 90 degree turns ! Thanks for the nice review , tips and tricks. Looking forward to visit this park in June 2018 with my friends.